Hello! It is now two weeks into my Carson fieldwork, and thankfully, I think I might know more now than I did a week ago. Maybe. However, I’m also far more confused, but I’ve had many helpful suggestions from friends. So, first of all, thanks to everyone for writing and posting, your suggestions and advice have helped immensely! But I imagine you’re also wondering, “well, is it a wall trench?” – sadly, I doubt it is. But there are many other possibilities…. Before I get started, it has been quite a busy day and I’m going to crank this post out as fast as I can – please forgive any mistakes today. I went up to the Hollywood site today and helped Bryan Haley by excavating some sediment cores on the top of Mound A using an Oakfield – we got down 3 meters using extensions! 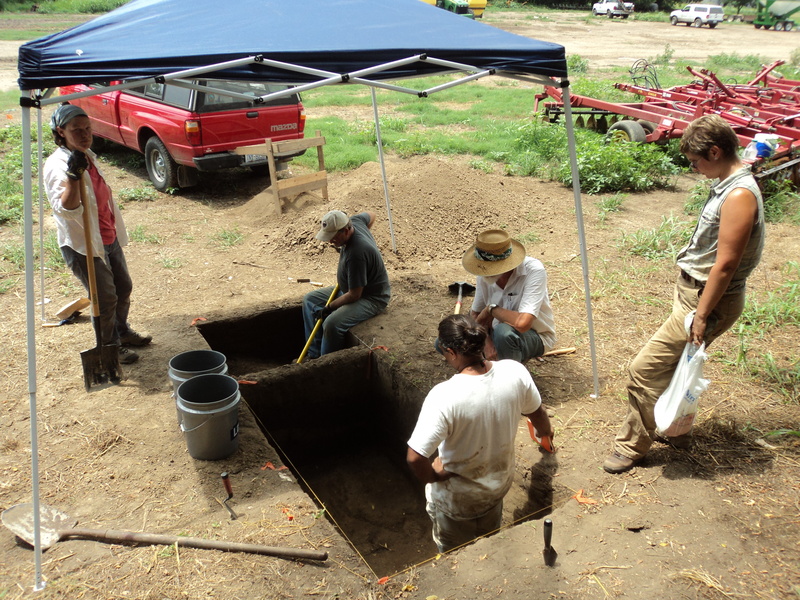 We also did some magnetometry on the top of the mound and possibly identified a structure on the summit. Where did I last leave off? 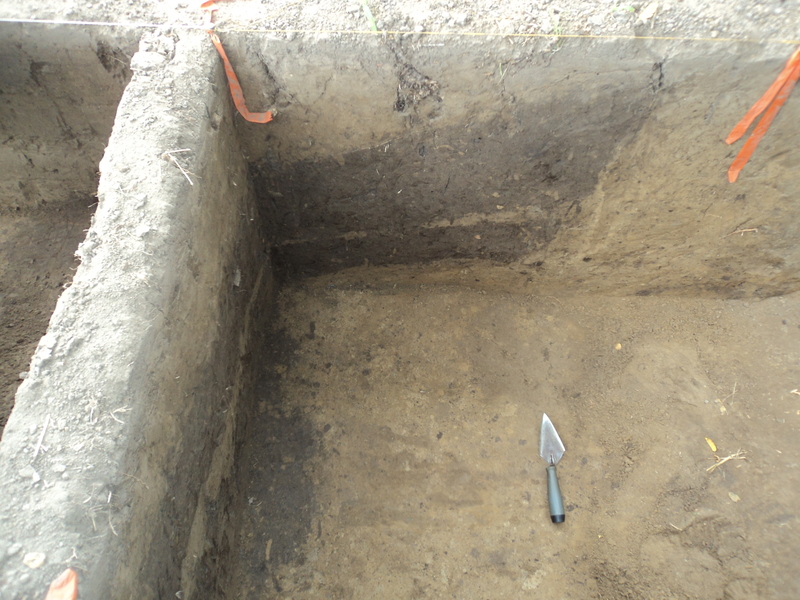 Well, pretty much I was 20 cm down into a 1 x 2 meter trench and had found a soil feature that stood out quite prominently against the light brown soils around it. 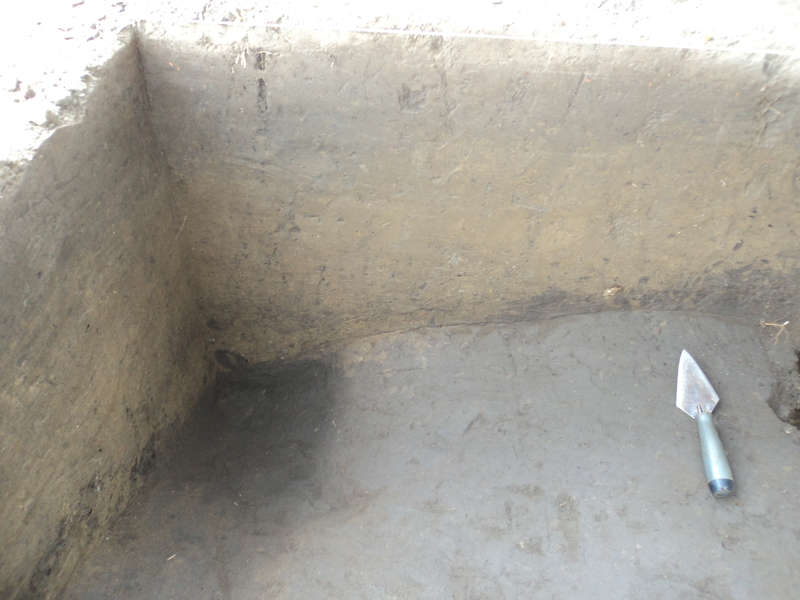 Due to its linear shape, and vertical wall profile, I began to think I’d uncovered a wall trench. This would certainly have been an interesting soil feature, as there are several (if not many more) examples of mounds with berms and/or wall trenches around them – perhaps to demarcate a specific area for the mound, or alternatively to keep the sediments in place while construction is going (think of all those orange silt fences around construction sites). 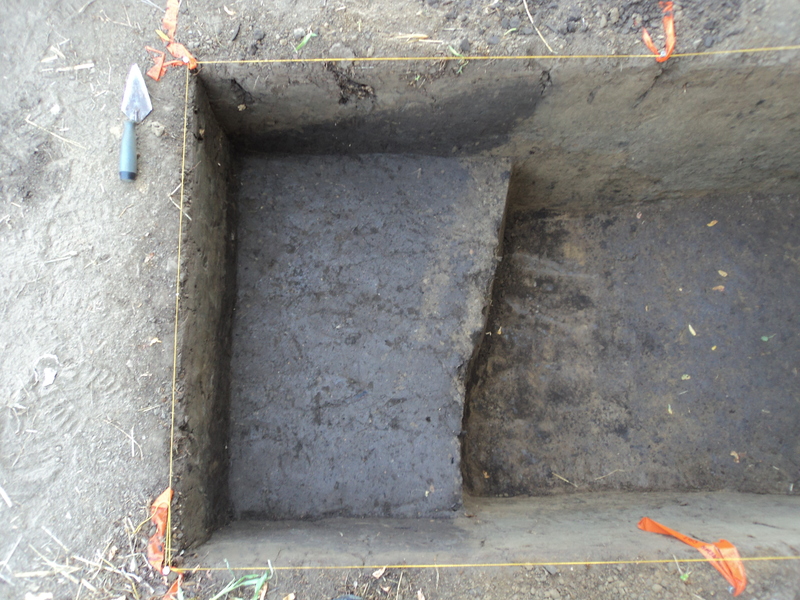 Well, as we started to remove layers from the downslope (far western) unit, it became readily apparent that the wall trench was actually a much larger feature – remember how it got wider towards the south end of the unit – well, as we removed dirt, it got wider towards the north as well. At this point, after removing 40 cm of soil from TU1, it had become fairly evident Feature 1 was some sort of mound stage, deposited as sheet loads of similarly colored sediment, and at a much steeper angle than the current angle of repose of the mound. This darker colored fill dirt is not at all evident in TU2. Given the slope of Feature 1, I was curious to discover how thick it was (abt 50cm), so we continued to dig down through the unit to meet the bottom of TU2, which was about 80 cmbs. By the by, in TU2 we have only encountered a ubiquitous 10YR 4/3 (brown?) silt loam that is likely mound fill – we are continuing to dig this unit in order to reach the buried anthrosol at around 2.5 mbs and the crevasse sands at 3 mbs – looks like my work is cut out for me. Anyways, after digging a few more levels in TU1, it became obvious that we were dealing with mound construction episodes, as seen in the banded layers of darker mound fill and lighter fill dirt. I am certainly curious to know if this pattern of alternating colors in mound construction will continue, as there are so many cool things to say about alternating colors in mound fill. Time to keep digging… What is also interesting and kind of weird, is that the feature 1 deposit does not follow the existing slope of the mound! Check out the picture below from the bottom of level 6. Its a little hard to tell from the above picture, but we decided it would be prudent to open additional units – therefore we opened a 1 x 1 unit west of TU1, and next week, when I get Mississippi Archaeological Association volunteers, I’ll open a unit either north or south to see how far this feature extends – and if it is sheet deposited mound fill, maybe it extends all around the mound?!? Also, a few well placed Oakfield cores might help delineate the feature. 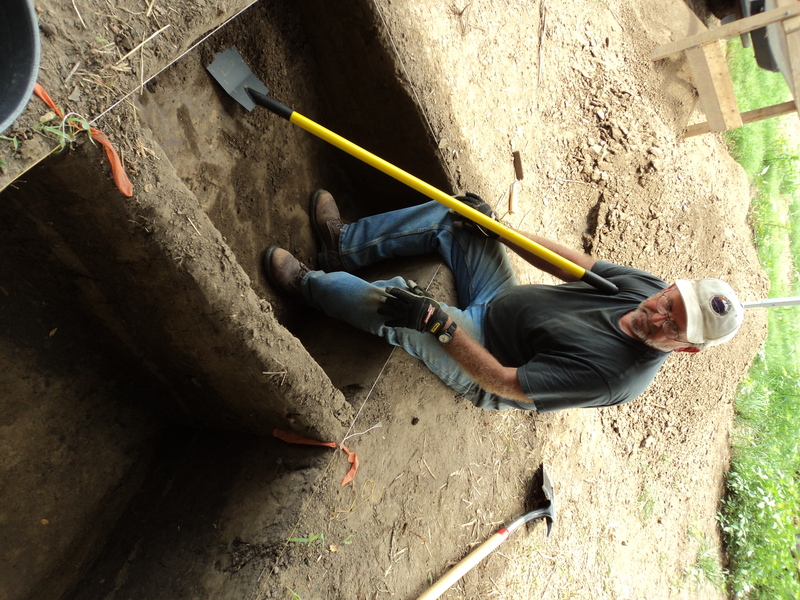 A neat suggesting by Bryan Haley is that given the slope of this feature, and how it differs from Mound D, perhaps this feature represents a previous mound that predated Mound D that was decommissioned or destroyed for the purposes of building Mound D.
Special thanks go out Benny and Gena, two fantastic volunteers who really know their archaeology – thanks!! Below is a picture of TU3 that they got started last week. Thanks to Benny and Gena Roberts, from Byrum, Mississippi - two great vols!! 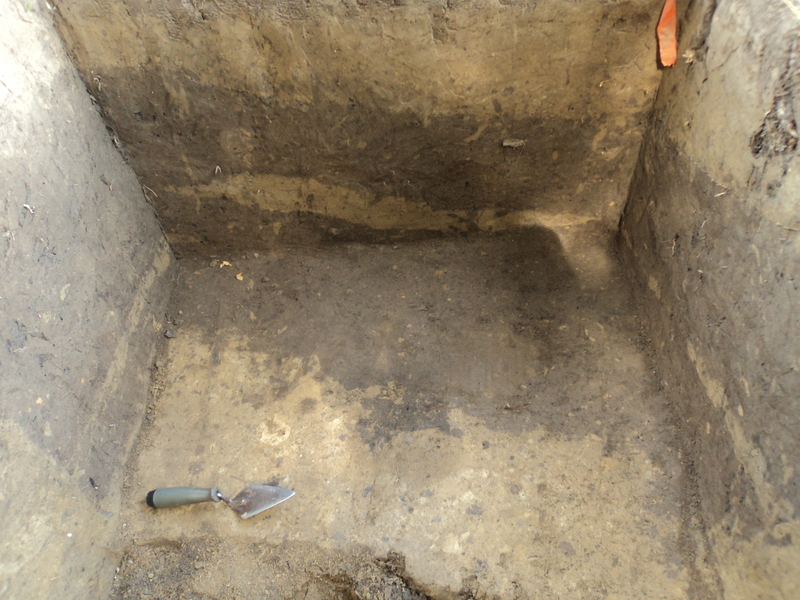 Bottom of level 2 in Test Unit 3 - floor of unit shows the darker soils of the sloping feature I am calling Feature 1, likely sheet deposited mound fill - the slope depicted in the floor of the unit is not the same as the slope of the mound. Also, many many many thanks go out to Rachel Stout Evans, the wonderful NRCS soil scientist who is helping me with this project. She’s on the right in the picture below. 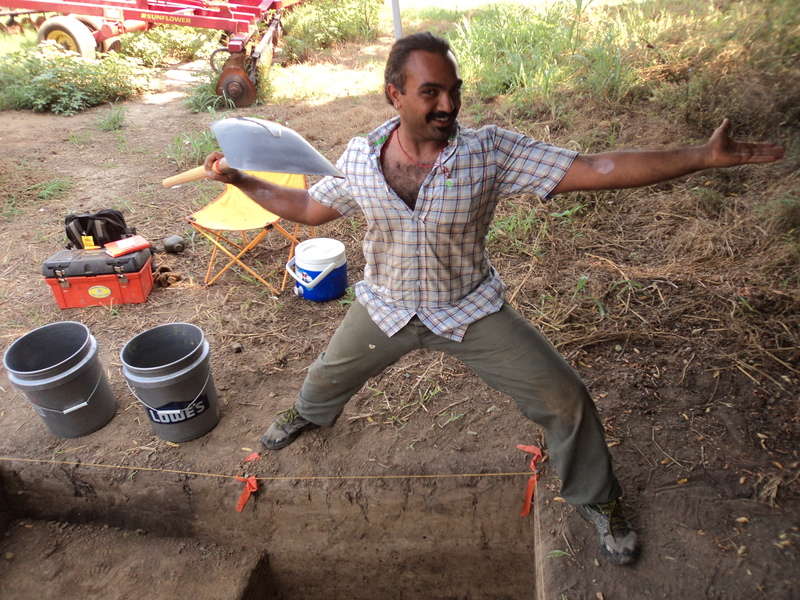 Sediment coring is going swimmingly and we’ve conducted an entire transect between mounds D and C – I wish I had time to explain our findings right now, but I still have to make the weeks grocery run to make and to prepare for the weeks excavations. So, enjoy the pics. BTW, eating dinner at the Stone Pony in Clarksdale, MS, just down the street from Ground Zero – the Stone Pony has fine pizza and healthy salads – a respite from Delta fare for sure! Thanks for the update, and good luck this week. Are there many or any artifacts in these mound deposits? Happy digging! Looks like you are having a productive summer! I look forward to a more detailed treatment at SEAC. Stay cool! Who’s the guy in the last picture–the one with the short hair?